Here's a look at work underway in the Lower Mainland Flood Management Strategy. 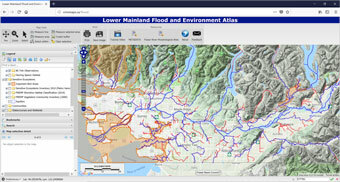 The Lower Mainland Flood Management Strategy is developing a new Lower Fraser Floodplain Model. Following an RFP process, Northwest Hydraulic Consultants was retained for the work, and initial runs were underway in the fall of 2018. The Lower Fraser Floodplain Model will be based on a new digital elevation model that encompasses both the river channel and the floodplain. The Floodplain Model will be used to better understand how water moves down the river and across the floodplain under various flow scenarios. It will also be used to analyze the effects of dike breaches; to create flood hazard maps that show the extent, depth and velocity of floodwaters; and to evaluate the effectiveness of proposed flood mitigation options. combine the newly-collected data with existing bathymetric and topographic data to develop a digital elevation model. The bathymetric survey measured the underwater depths of the river. It was conducted by boat using single (sonar) beam hydrographic equipment and software. The final elevation data from the survey was combined with data collected by Public Works & Government Services Canada in 2015, LiDAR topographic data commissioned by the Province of BC and other data. A digital elevation model (DEM) has been derived using these datasets. 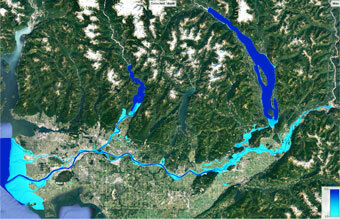 The DEM provides a critical input for the development of the new Lower Fraser Floodplain Model. Lower Mainland local governments and other flood authorities were surveyed in the fall of 2017 about their short- and long-term priorities for flood mitigation, and what factors should be weighed when setting regional priorities. Additional technical analysis, consultation and dialogue will be facilitated to further refine priorities for the Lower Mainland Flood Management Strategy. In consultation with the Joint Program Committee for Integrated Flood Hazard Management, FBC has identified a range of approaches to flood mitigation to consider in the context of a regional strategy. Floodproofing requirements for new and existing development in floodplain. Suitability of options for diverse local and sub-regional circumstances. An initial inventory and analysis is in progress to document past, present and emerging approaches on funding and decision-making related to flood risk. Examples from BC and other jurisdictions are being reviewed. Near-term funding opportunities are being explored, as well as the potential to establish a new funding program for longer-term strategy implementation. The business case for proactive investment and regional cost-sharing is also being developed. The results of this work will be presented in a discussion paper and in the Flood Strategy Interim Report (Draft) for initial consideration by participants in the LMFMS. 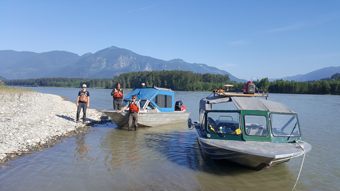 An online map atlas and document library are being developed to identify environmental values and features along the lower Fraser River and coastal foreshore areas – in the context of flood hazards and flood management. The atlas will help identify potential environmental benefits and adverse impacts of flood mitigation works or policies. It will help decision-makers flag issues likely to require review in regulatory processes and identify potential candidate sites for habitat protection, conservation, restoration or compensation. The Province introduced seismic guidelines for new and existing high-consequence dikes in 2011 (updated in 2014). The aim was to better protect the diking system from earthquake damage. Local authorities and design professionals in the Lower Mainland have found the standards are technically challenging to implement in many locations and/or cost-prohibitive. develop professional practice guidelines for effective and consistent application of seismic risk assessment and design. This initiative is expected to improve understanding of seismic vulnerabilities and to develop and implement a well-defined and regionally accepted program to improve the seismic resilience of Lower Mainland dikes. The Fraser Basin Council has retained a consultant to review risk assessment methodologies and recommend a methodology that would be suitable to assess orphan dikes in BC – that is, dikes with no local authority for operations and maintenance. to respond to emergency flooding situations or were built by others and abandoned. These works generally lack adequate planning and engineering design due to the emergency conditions under which most were constructed. They are not typically maintained or inspected by a diking authority. A second phase of work will involve assessment of the orphan dikes using the recommended methodology, including field assessments. The project will evaluate the condition of the orphan dikes, the associated risks of failure and what is needed to bring each up to provincial standards and into a state of readiness to establish a local authority. While only a small number of orphan dikes are in the Lower Mainland, the project will help identify any significant risks associated with them. The project is funded by the Province of BC with the aim of helping local governments, the public, and the Province to quantify and understand the risks that these structures pose to BC communities. The project will also assist interested local governments that wish to mitigate these risks by assuming the role of diking authority, if warranted. The BC Storm Surge Forecast model provides important 5-day forecasts of coastal flood conditions in the Georgia Strait. Coastal partners in the LMFMS and the Province of BC have cost-shared the operation of the BC Storm Surge Forecast Model over the 2016-17 and 2017-18 storm seasons (October through March). Funds for continued operation and enhancement of the forecast model have been secured for the 2018-19 and 2019-20 storm seasons. The model is operational for the coming (Winter 2018-2019) storm season. Looking for the latest? The Flood Strategy Briefing is a progress bulletin distributed to partner organizations* in the LMFMS and published online. If you would like to receive the next issue directly, please subscribe. Note to Strategy partners: The Fraser Basin Council sends the Flood Strategy Briefing to your organizations via your chief administrative officer or executive officer (or other contact on request) for internal distribution, as well as to those in your organization who are participants on LMFMS committees.